How to live with God TenchiKanenoKami. Now you are under the umbrella of God TenchiKanenoKami's prayer. Please let's pray for true world peace. Let's pray for the sake of the peaceful world without war. It is the first step in efforts toward the realization of true world peace to practice the spirit of heaven and the spirit of earth. We focus on the spiritual growth for true world peace. The so-called trouble is the divine blessing given by God Tenchikanenokami in order to reform oneself. Our ultimate end of the spiritual growth is the WaGaKokoro of peaceful and joyful heart. We do the faith practice to cultivate our wagakokoro of peaceful and joyful heart. God TenchiKanenoKami has wishes for us. The divine wish for us and the divine plan for us are much bigger than our wishes and plans. We were born in this world under the divine wishes, and we are kept alive now under the divine wishes. The divine wishes for us will be fulfilled when we cherish the course of events happening to us. It is essential for us to respect and cherish the course of events happening to us through practicing and learning the Spirit of Heaven, Earth, Sun and Moon. We should aim for the WaGaKokolo of peaceful and joyful heart and pray for it to be bestowed on us. This is because the WaGaKokolo of peaceful and joyful heart is the best divine blessing which people may receive. Anyone can achieve salvation just by waking up to the wagakokolo of peaceful and joyful heart and seeking for it with great ardor. Respecting and cherishing the course of events happening to us will develop our wagakokolo of peaceful and joyful heart. Wagakokolo is one of the states of heart and mind. Wagakokolo is the state of peace of mind and joy of heart. We need an awareness of wagakokolo. For the sake of this we need to listen to the teachings everyday to grow our spirit because the teachings are food for the mind and heart. Living God Konko Daijin taught us that the blessing is in one's wagakokolo of peaceful and joyful heart. Please let's remember the wagakokolo and try to have the wagakokolo no matter what situations we are in. Please let's live a life with wagakokolo. The following equation is true. (the course of events happening to us) times (the spirit of heaven, earth, sun and moon) equals (the WaGaKokolo of peaceful and joyful heart). "I believe that all is the world of gratitude. There is nothing which does not become an object of gratitude." The course of events which happen to us is God's working. The principle of the Otsubo School is simple and clear, and we can surely receive God's blessings by it. When we cherish the course of events happening to us, it cherishes us. We can make an experiment on the principle of the Otsubo School, and then we can receive an actual proof of it. We can get into the rhythm of the Heaven and Earth, so we can enjoy practicing faith with thanks and pleasure. Also, we come to be able to feel familiar with God TenchiKanenoKami and his working. We are filled with wonder and delight in the practice of faith. The focus is to practice the Spirit of Heaven, Earth, Sun and Moon through the course of events happening to us. The spirit of heaven is a beautiful spirit like the heaven gives unlimitedly its boon to anything without a condition. The spirit of earth is a passive spirit like the earth accepts anything even dirty water without a complaint and makes them manure to grow beautiful flowers and delicious fruits. The spirit of sun and moon is a persistent and accurate spirit like the sun and moon persist their movement accurately without a break and selfishness. Then, you can obtain the peaceful and joyful heart. We were born in this world to polish our spirit, so this world is for the next world. Everything happens to us in order to cultivate and polish our heart. The blessing is in one's own heart with peace and joy. First, a human needs to realize that one is born in this world to cultivate and polish one's heart so that one may become truly happy. The principle of the Otsubo School shows how to cultivate and polish our heart, and how to receive God's true blessing. Practicing the faith is to cultivate the spirit and develop WaGakokoro. What kind of spirit should we cultivate? How do we cultivate the spirit? We are aiming to cultivate the Spirit of Heaven, Earth, Sun and Moon. Especially it is fundamental to cultivate the spirit of earth through the course of events which happen to us. 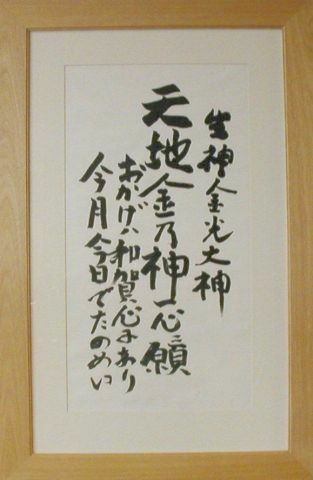 The spirit of earth is the main concept of the Ideal of Mutual Delight and Respect in the Otsubo School. The spirit of earth is a receptive spirit like the earth which accepts anything even dirty water without saying a complaint and makes them manure to grow beautiful flowers and delicious fruits. The first step in practicing the faith is to cherish the course of events which happen to us. It is of course most important to respect and cherish God TenchiKanenoKami. To respect and cherish God TenchiKanenoKami is to respect and cherish his workings. The course of events which happen to us is the workings of God TenchiKanenoKami. Thus, to respect and cherish the workings of God TenchiKanenoKami is to respect and cherish the course of events which happen to us, so to cherish the course of events is to respect and cherish God TenchiKanenoKami. Furthermore, the course of events which happen to us is nourishing food for our spirit to cultivate it. Therefore. when we accept the course of events which happen to us with the spirit of earth, our spirit will be cultivated to receive divine blessings. If you make an experiment with cherishing the course of events, you will feel God TenchiKanenoKami's workings. Wa means peace, Ga means joy, and Kokoro means heart; then, WaGaKokoro means a peaceful and joyful heart. My name is Hironobu Nakahara, and I am an intercessor between God TenchiKanenoKami and a man; also, I am a TA (Teaching Assistant) of Wagakokology at Wagakokology Laboratory. The professor of Wagakokology is God TenchiKanenoKami. What I express on this website is based on the Ideal of Mutual Delight and Respect (between God TenchiKanenoKami and a man) of the Otsubo School. The God TenchiKanenoKami's wish is that people receive true divine blessings leading to divine virtue and cultivate their divine nature since a human has human nature and divine nature as God's children. There are three types of blessings. 1) One is a favorable blessing for a prayer which is received by one's request. 2) Another is a favorable blessing for a prayer which is received by one's reform of the mind. 3) The other is a blessing leading to divine virtue which is received by one's peaceful and joyful heart. God TenchiKanenoKami wants you to receive true divine blessing by your peaceful and joyful heart. However, it seems hard that you have a peaceful and joyful heart immediately. You will be able to receive true divine blessing step by step. Step 1) To receive divine blessing by divine intercession requests. Step 2) To receive divine blessing by your reform of your mind. Step 3) To receive true divine blessing by your peaceful and joyful heart. Therefore, God TenchiKanenoKami will bless you for your request as the first step. Then, you will be guided to the final step gradually. Kami-sama's and my focus is that people receive blessings leading to divine virtue, namely, true divine blessings with true faith. First of all, to accept what happens to me as Kami-sama's working is essential. As an entrance into true faith you can send me any kind of your divine blessing (prayer) request. I will mediate and pray to God TenchiKanenoKami with my whole heart for you to receive divine grace. This is because your salvation is my salvation and God's salvation, too. There seem to be two types of divine intercessors. One is an intercessor as an agent for humans, and the other is an intercessor as an agent for God TenchiKanenoKami. Anyway, asking the divine intercessor to convey your wish to God TenchiKanenoKami is much more effective than praying alone to God TenchiKanenoKami by yourself. Please try to ask for the divine intercessor. How to ask a divine intercessor to convey your wish to God TenchiKanenoKami. Your wish may come true by asking an intercessor between God TenchiKanenoKami and a man to convey your wish to God TenchiKanenoKami. Your pain is my pain and God's pain, and your suffering is my suffering and God's suffering; then, your pleasure is my pleasure and God's pleasure. You will receive more than your expectation and your wish by practicing the Ideal of Mutual Delight and Respect (between God TenchiKanenoKami and a man) of the Otsubo School. The following videos are sermons preached by the Rev. Soichiro Otsubo, the former head minister of Konkokyo Airaku Kyokai in Kurume-city, Japan. The player will show in this paragraph. The followings are sermons preached by the Rev. Soichiro Otsubo, the former head minister of Konkokyo Airaku Kyokai in Kurume-city, Japan.